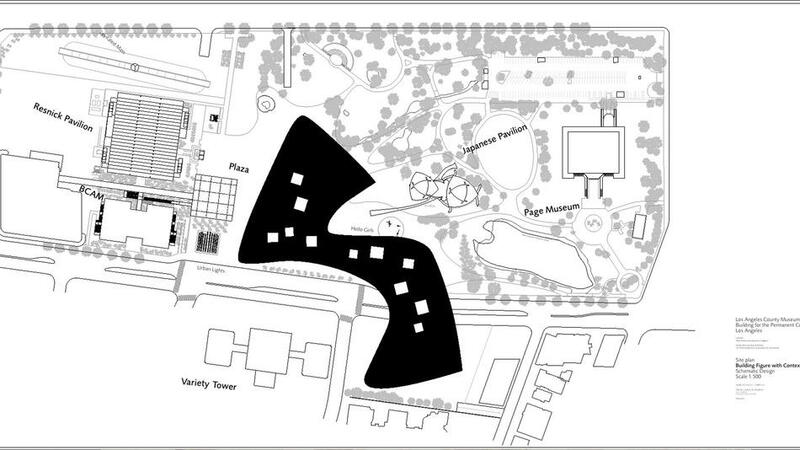 Overlay of latest Zumthor design of LACMA. Map courtesy of Google. 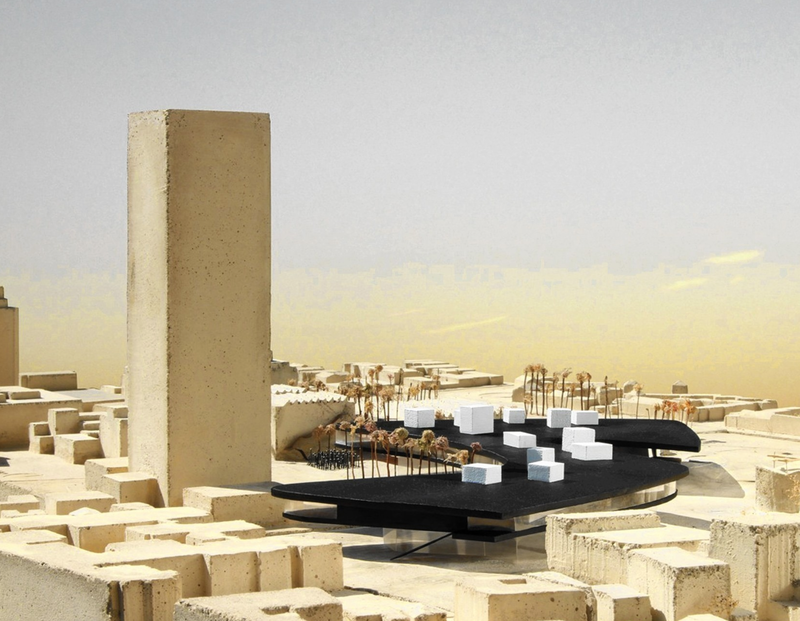 The latest iteration of the Peter Zumthor design for a new Los Angeles County of Art was revealed last month. The original oil blob concept has been squared off and its roof has been perforated by rectangular protrusions to allow for taller galleries. The “horizontal skyscraper,” as L.A. Times architecture critic Christopher Hawthorne describes it, still bridges Wilshire Boulevard. 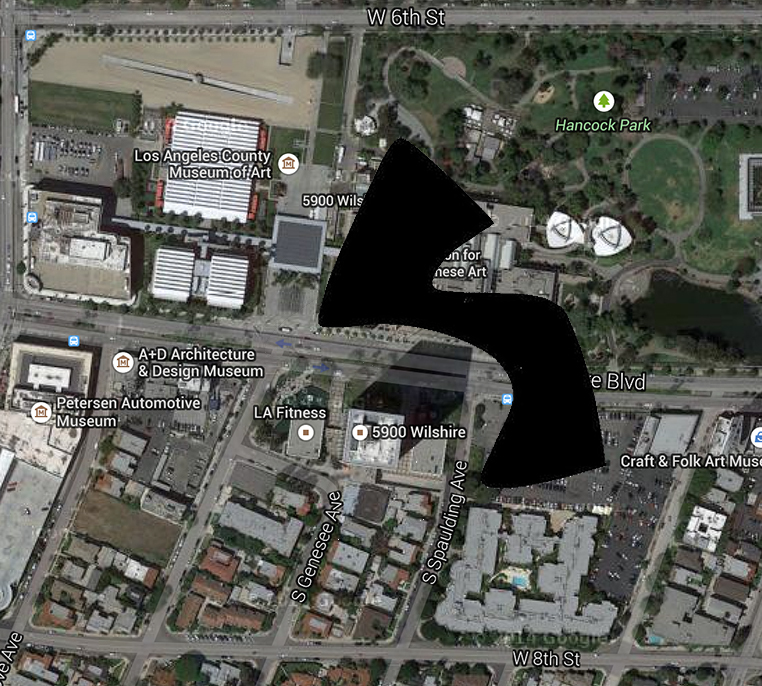 Its footprint south of the boulevard – on what is now LACMA’s Spaulding Avenue parking lot – appears to have swollen in size to accommodate its new function as one of only two entrances to the museum and as the location of a ground floor 300-seat theater. Thirty to forty feet above this will be a south facing open-air plaza overlooking the Wilshire Galleria condominiums located north of 8th Street between Spaulding and Stanley Avenues. On March 25, 2015, Hawthorne hosted an event, “Debating the New LACMA,” as part of his Third Los Angeles Project at Occidental College. The symposium featured LACMA Director Michael Govan, making a pitch for the new museum, and a panel of experts examining the pros-and-cons of the proposed re-do – including architecture critic and Miracle Mile resident Greg Goldin, a frequent contributor to this newsletter. At the gathering it was emphasized that Zumthor doesn’t design on paper as much as he does with models. His process, we were told, is notoriously slow and involves numerous interpretations. But it is clear that regardless of the final design, the new museum will span Wilshire and invade a densely populated part of the Miracle Mile. Wilshire Boulevard has always more-or-less served as a moat to shield the nearby residential area from the full brunt of disturbances from museum traffic, events, and noise. By lurching south of the boulevard into the Miracle Mile the largest museum west of the Mississippi River will become the hulking next-door neighbor to thousands of residents. This intrusion is fraught with problems – it is the museum equivalent of “mansionization” and will overwhelm the entire neighborhood. Zumthor’s original design encountered stiff resistance for encroaching on the La Brea Tar Pits. “We love the Tar Pits,” Govan quipped, “but they didn’t love us back.” It is obvious that he has now set his sights on the residential area of the Miracle Mile. At the Occidental College event Hawthorne raised a frequent criticism of Zumthor’s elevated single-story plan for the museum: that it will not easily allow for future expansion. Hawthorne: [interrupting] So, you’re talking about on Wilshire Boulevard? Govan: Well, on or around. You have to get across the boulevard to do that easily. Because of the way the Tar Pits frame and you have buildings on the other side. So, that’s the only way to go. Translation: LACMA has nowhere to grow but south, into the residential blocks below Wilshire. Like the Museum of Modern Art in New York and other museums with global ambitions, LAMCA would gobble up its neighbors. Govan’s assurance that future expansion will not occur in this century is undercut by the fact that since opening in 1965 LACMA has been expanding (or trying to). By their very nature, major museums must grow or die – particularly in this age of monument building and star architecture. Govan knows this. By stubbornly adhering to the obvious limitations of an elevated single-story concept for a new museum, LACMA has no choice but to move into the Miracle Mile. The welcome mat is not out. This entry was posted in News and tagged Christopher Hawthorne, Debatin the New LACMA, Greg Goldin, La Brea Tar Pits, LACMA, Los Angeles County Museum of Art, Mansionization, Michael Govan, miracle mile, Miracle Mile Residential Association, mmra, Museum Row, Peter Zumthor, Third Los Angeles Project, Wilshire Boulevard. Bookmark the permalink.